Maduk, Nukul and I got into the car and Reenod took us out of tortuous northbound road and headed westwards along the Trisuli River. Nukul was going home, so we dropped him to let him catch a bus back to Kathmandu. We had 400km to go. 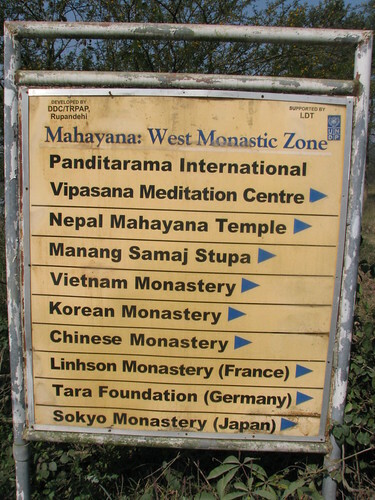 This is the same way as that towards Pokhara, except that Lumbini is much further to the south. Maduk suggested that we spent the night at Malekhu, a small, somewhat nondescript town on the Kathmandu-Pokhara Highway. We arrived at Malekhu just before sunset. Reenod was a good drive – fast but safe. But he also brought along 2 bottles of Khukuri Rum from Kathmandu. Maduk picked the best motel in town, but they were full. We settled for the second best. In order to save space, a lot of these shops and houses have extremely narrow spiral staircases made from think metal strips. With backpack and all, it was quite a struggle to get to my room upstairs. I just wonder how they managed to get beds and other furniture into the rooms. The room they gave me was spacious and spacious was the only good thing about it. Everything was dusty and terribly decrepit. Soon, it was dinner time. I descended the ridiculously steep and narrow spiral staircase and got down to the restaurant downstairs. 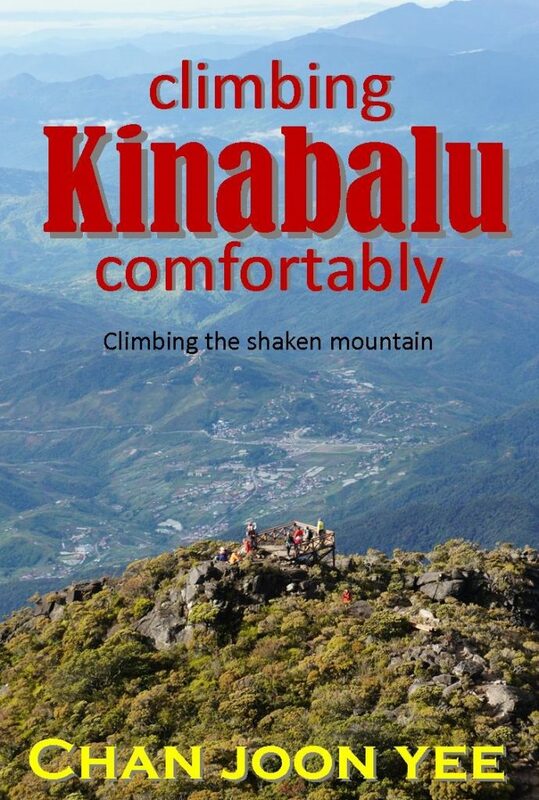 With my legs still wobbling from the trek, it was a challenge not to let my knees buckle. The restaurant wouldn’t pass any NEA inspection in Singapore, but it had some character. Not only were the tables and chairs out in the open, even the kitchen was out in the open. Things didn’t look very appetising but I decided to take a risk and gave the fish curry a try. It was surprisingly good. Definitely some of the best fish curry I’ve had. After dinner, I tried some of their deep fried shrimps for dessert. Lots of black tea and a 1.25 litre bottle of Sprite for further rehydration. I was still at Sing Gompa that morning! Just imagine how fast you can travel with private transport. Maduk and Reenod were high on Khukri Rum, laughing and telling silly jokes. As the sky drew its curtains, a fleet of noisy motorbikes pulled up at the restaurant. Nepalese youngsters dressed in their best clothes rode in for a feast. The girls were dressed in Tibetan garb with Indian colours. The guys were in their jeans and leather jackets. Having tasted the killer fish curry, I knew why they were here. A boisterous event on a Saturday night. Maduk, Reenod and I could only watch in envy. My stomach seemed to have accepted the fish curry and “beaten” rice. I was almost regretting not taking any of the Khukri Rum offered to me, but sleep was not difficult that night. I woke up before the sun was out. Power failure again. I sat in bed till a bit of sun managed to peer through the thick morning mist. I drew the curtains, packed my bags and got ready. The boys slept for a little while more, then Reenod was ready and we were on the road once more. 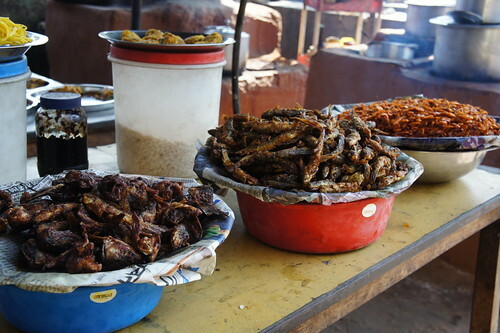 I admired the oranges sold at the market at Malekhu, but Reenod told me that further up was a town called Mudelin. They have the best oranges in Nepal. 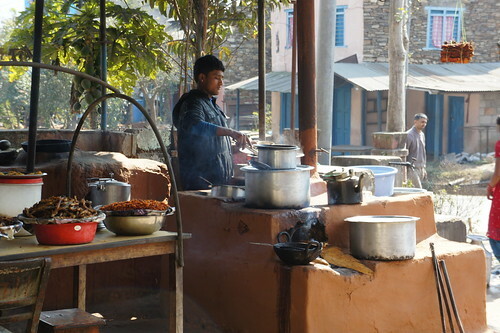 We had a quick breakfast at a resort inside Chitwan National Park. Then, we turned away from the road leading towards Pokhara and headed south towards the plains near the Indian border. Presently, we arrived at Mudelin and bought some oranges. No regrets. They were delicious. Lowland Nepal looks a little like Thailand. Vast green fields, not a mountain in sight. This is an unNepalese as it can get. If you have seen the Vietnamese, Burmese, Cambodian and Indian countryside, Nepal does not seem poor at all. In fact, there are far fewer beggars here than in India. Houses in the lowlands seem better constructed than those in the north. Food and fruits are plentiful and temperatures began to climb as the sun rose above our heads. 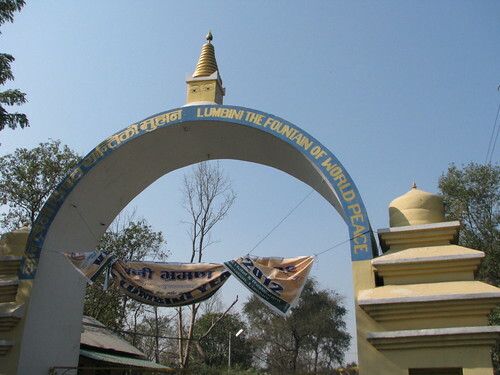 The entrance to Lumbini was unimpressive. There are no ticket counters here. Anybody can walk in and out freely. 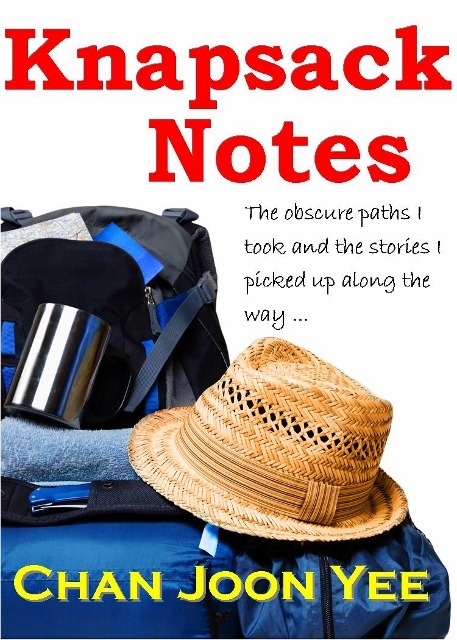 It was the endless stream of pilgrims moving in and out of the place that made it look grand. The place was vast, the maps and directions confusing. 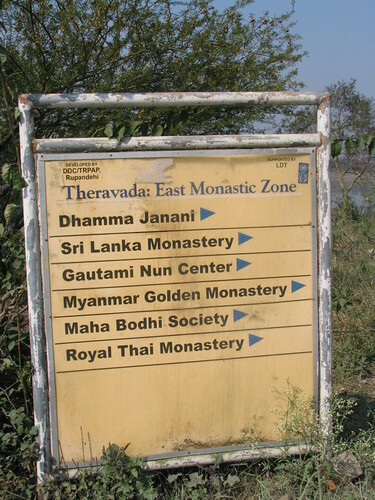 Basically, the first place you’ll see is the Mayadevi Temple. This is the only place where you need to buy a ticket to enter. Photography is not allowed inside the Mayadevi Temple. Inside what appears like a white fortress, is an archaeological site – the exact spot where Lord Buddha is said to have been born. Inside the premises, you’ll see archaeologists still digging away and nuns chanting in the background. Just behind the Mayadevi Temple, is the pool where the queen bathed before she gave birth to the Buddha. 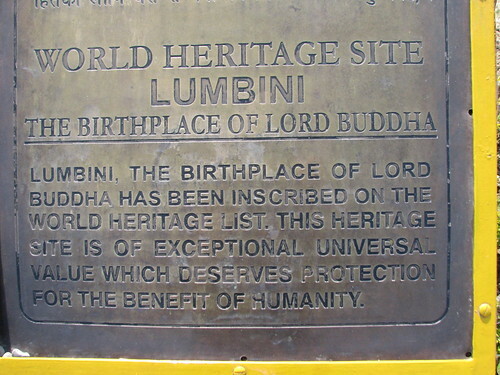 Though it’s not really that important that we honour the Buddha this way, I think the preservation and even the development of Lumbini is important in giving people born in a Buddhist tradition to appreciate the historical aspect of Buddhism. The Dalai Lama once said that the disadvantage of being born in a Buddhist tradition, is the tendency to regard the Buddha as a mythical figure capable of magic and miracles. They chant, they pray and they practice rituals as a routine. When asked by outsiders what they believe in, most of these individuals are unable to articulate. Some even say quite erroneously that the Buddha is their god. Ironically, it’s foreigners who picked up Buddhism out of interest who bother to study the life history of the Buddha and his actual teachings. 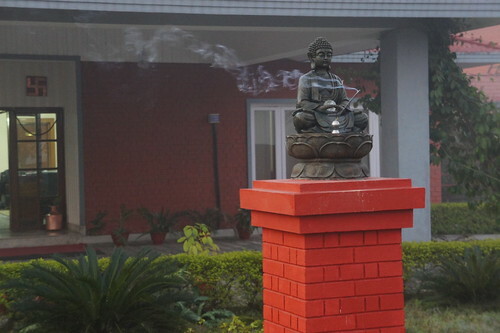 The authorities at Limbini divide the foreign temples into Theverada and Mahayana schools. 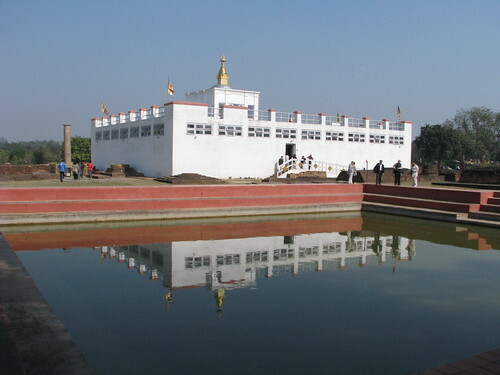 To date, there are about twice as many Mahayana temples as there are Theverada temples in Lumbini. 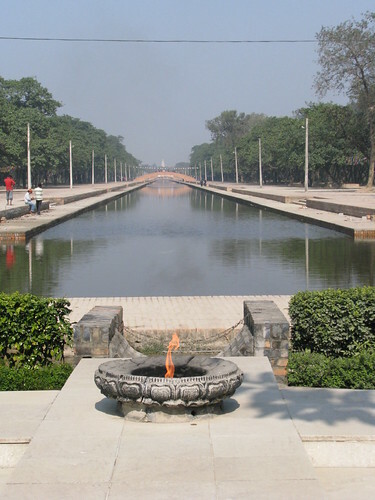 The divide begins just after the Eternal Flame which sits in a cauldron in front of a canal. There are two paths on either side of a canal. From the paths, unmarked and confusing paths lead the way to the temples. 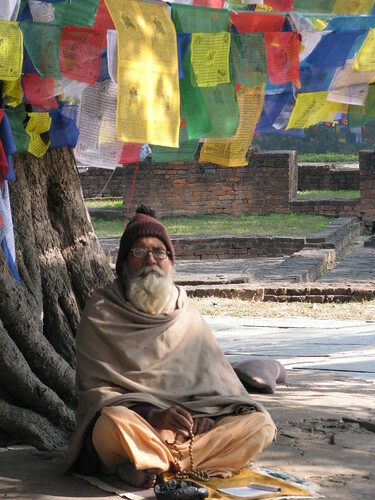 Like Gosainkund, Lumbini was a test of the pilgrim’s endurance. 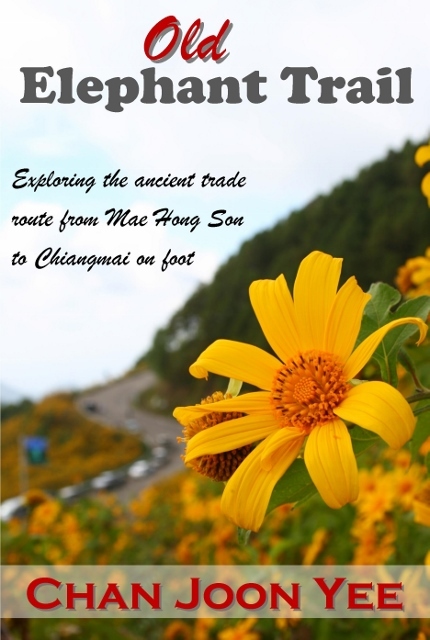 A walking tour of the place can easily take 3 to 4 hours with lots of time spent searching, backtracking and going in circles. Seeing all the temples would be an ultimate challenge. I think the Chinese and German temples are quite worth a visit. The Thai temple was very strangely painted white. At the end of my tour, I was exhausted and dehydrated again. 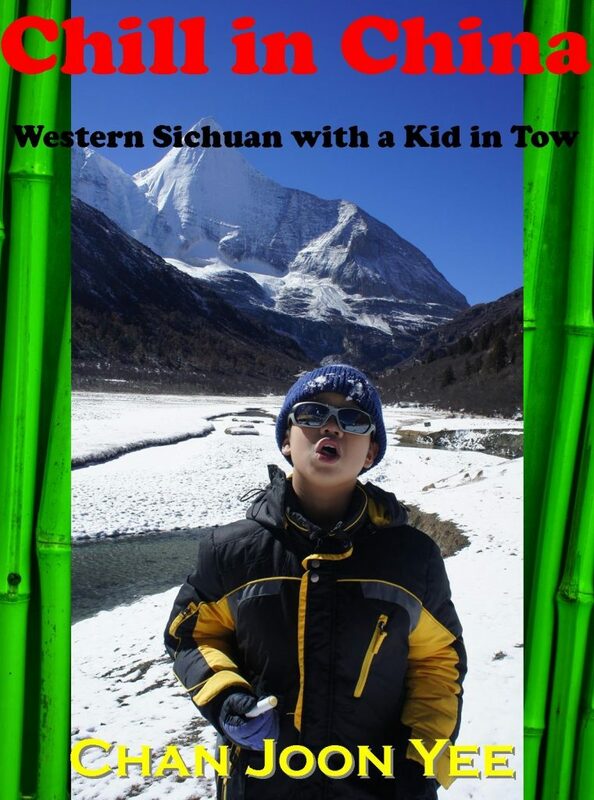 A plate of chow mien and a bottle of Coke took care of things until we headed for a resort nearby to spend the night. It was a beautiful place; clean, tidy and very well-furnished. Still, the power supply was a problem and the hot shower wasn’t hot enough. The owner has lived and worked in Singapore for 14 years. He missed our MRT and the way things are organised in Singapore. It was fun talking to him. The hotel had a very nice bar call The Merlot. 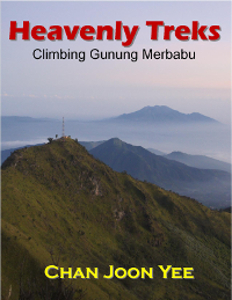 Their room were clean, and room service was excellent – even better than the Holy Himalaya. At the dinner table, the waiter brought a bottle of mineral water to me. For a moment, I thought he was going to perform a miracle and turn that water into wine. My stomach fully recovered, I decided to stretch things a bit with a tandoori chicken and a Kashmiri pulao. I think the secret to juicy tandoori is to order a whole chicken that they bake fresh. Definitely one of the best tandoori chicken I’ve ever had. The Kashmiri pulao was a letdown. Too much vegetables, not enough fruit. Anyway, I ate my fill and had a wonderful night. 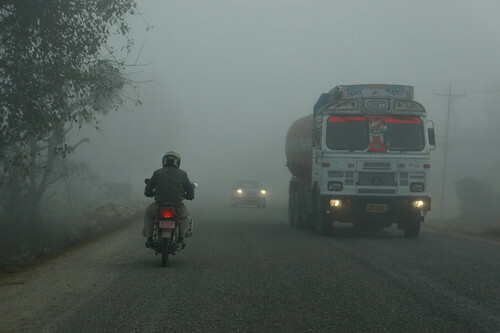 A cold 6 deg mist enshrouded Lumbini the next morning. Reenod drove bravely out into the Mahendra Highway. He drove quickly and overtook safely. We reached Malekhu in time for a lunch of the killer fish curry and then made it to dusty and noisy Kathmandu at about 3.00pm. I told Maduk to meet me for dinner. That evening, he brought his son. He named him Parbat or mountain. 7-year-old Parbat was a lovely little boy. We had my last dinner in Kathmandu before flying off the next day.